Since I started trading, I have been following financial news and next week looks scary. You have been investing much longer than I have, and I am sure you are on top of things. That said, I am very worried that a stock market crash might begin next week. 1) First of all, third quarter earnings have been disappointing so far, and next week is very busy in terms of earning announcements which are going to be bad (a lot of financial institutions have issued warnings). I don't know how much more stomach investors have for bad earnings. 2) Second, there is evidence of a slowdown in internet spending which is likely to disappoint soaring tech stocks. Both Yahoo and Google are set to report next week. 3) Third, Consumer Credit Crunch looks like it is rapidly worsening: "Homebuilder Beazer said that a whopping 68% of customer sales contracts were cancelled in Q3." "sales tax receipts in 25 states have dropped to "recession levels."" 4) Fourth, The credit crush that sent markets crashing in August might be coming back with a vengeance. More than $4billion worth of bonds backed by residential mortgages and other structured debt products could soon hit the market as a result of forced sales by the SIV and SIV-lite sector. If this occurs, financial institutions will have to book astronomical loses, and it will make August's credit crush look mild in comparison. 5) Fifth, China's stock bubble is reaching such unsustainable levels that it is being mentioned in barron and is scaring away investors like warren buffet. I believe that the reason the market managed to recover from August's crash was due nearly entirely to China's growth prospects. Investors are betting that international growth will offset the US slowdown (international growth = China). Any news that threatens this belief can send the market crashing, like last week's downgrade of Chinese search engine company Baidu.com by JP Morgan. I am worried that if next week' s earnings are disappointing enough it could cause the Chinese market to crash, which would in turn bring down US markets. I might just be overreacting to all this, but I see the market being threatened by at least five different factors, each of which might be enough to cause a major crash on its own. If even one of these factors cause the market to fall, it will likely trigger the others to manifest as well. Against this backdrop, the stock market is hitting all-time highs. The magnitude of the risk in the market right now is staggering. I don't want to give any advice, and maybe you have seen situations this bad before. I just felt I needed to share my apprehensions. Please let me know what you think about all this. Numerous large-cap companies will be reporting their quarterly results in the week ahead. There are too many to list here, but Briefing.com's earnings calendar provides the full rundown. Some names you'll find there include Citigroup (C), Johnson & Johnson (JNJ), Coca-Cola (KO), JP Morgan Chase (JPM), Intel (INTC), Nokia (NOK), McDonald's (MCD), 3M (MM), Yahoo! (YHOO), Google (GOOG), and Caterpillar (CAT) are all due to make announcements. "NEW YORK (AP) — Inside major Wall Street firms and across their trading floors, concerns about corporate earnings are getting difficult to ignore. America's blue chip companies — big business stalwarts like Merrill Lynch & Co. and International Business Machines Corp. — will release third-quarter results in the coming weeks. After a quarter marked by tightening credit conditions and concerns about a slowing economy, profit reports are expected to be the worst since 2001. And early signs this past week seemed to confirm what many on Wall Street feared — that results will show no growth from the year-ago period. Investors got a pair of profit warnings from International Paper Co. and Chevron Corp., while results from General Electric Co. and aluminum producer Alcoa Inc. failed to impress." "The reprieve of the past 10 days is over. Yesterday, Nielsen reported that spending by the top 10 web customers dropped in September vs. August. Homebuilder Beazer said that a whopping 68% of customer sales contracts were cancelled in Q3. Countrywide said Q3 lending volume dropped 44% year over year. Recent sales tax receipts in 25 states have dropped to "recession levels." Several major retailers missed sales estimates for September (Target, JC Penney, Nordstrom). The stock market remains strong, suggesting either that the worst is over or that investors have gone insane (with the right answer to be determined in 3-6 months), but yesterday's news wasn't good. Overview. We continue to believe that we may be in the first stages of a cyclical downturn for advertising and the Internet sector--one that could affect not only start-ups and second-tier players but majors like Google (GOOG), Yahoo (YHOO), AOL, et al. Such downturns do not begin suddenly, and they are not instantly obvious (except in hindsight). Rather, as with the housing market, the environment changes gradually, over many months, with early signs slowly becoming a steady torrent of bad news..."
This stands in stark contrast to anecdotal evidence across the lending spectrum. According to The Wall Street Journal, credit card lenders like Bank of America (NYSE: BAC) and Capital One (NYSE: COF) have started raising rates and fees on some cardholders, despite the recent drop in the Fed funds rate. Citigroup (NYSE: C) has hiked auto loan rates, and JPMorgan Chase (NYSE: JPM) has selectively tightened its standards for credit cards, home equity, and auto loans for customers living in areas where housing weakness has been the worst. One problem with the Fed's figures is that they don't show the whole picture. The Fed's statistics exclude mortgages and other loans backed by real estate. That raises the possibility that consumers are rotating their debt load away from real estate toward credit cards and other types of loans. With the ease and potential tax benefits from using home equity loans and mortgages to get cash, consumers were able to leverage low rates and appreciating home prices for years to meet their liquidity needs. Now that mortgage markets have started to tighten, consumers may be turning back to their credit cards to get their cash fix. But this isn't a new theory. Fellow Fool Tim Beyers wrote more than a year ago about how consumers can't keep spending on credit forever. Polling expert Gallup is convinced the credit crunch is coming. But the threat of a slowdown hasn't materialized. And after all the false alarms in the past, consumers may find themselves ill-prepared for a full-scale credit crunch, if one actually happens this time." "Like the partnerships that sunk Enron, these banks don't have to account for the SIVs until a time of crisis -- at which point they're required -- legally or to preserve their reputations -- to step in and buy them. (As a brief reminder, Enron had created off-balance sheet partnerships backed by huge borrowing which enriched its executives while hiding Enron's money-losing operations). In the case of the SIVs, nobody wants to discuss just how big the problem could be. My hunch is that the problem is so big that the banks and Treasury department are worried that an accurate accounting would deeply spook the financial markets -- leading people to withdraw their money from the stock markets and the banks that are on the hook for these SIVs. That's why they're working on a semi-secret government-arranged bail out. (Incidentally, I think the fear of how big the write off of this toxic waste would be is the real reason behind the Fed's September 19th 50 basis point rate cut.)" "More than $4bn worth of bonds backed by residential mortgages and other structured debt products could soon hit the market as a result of forced sales by the so-called SIV-lite sector - a type of vehicle hurt by the recent short-term debt market turmoil. Many market participants have struggled to raise funds in the asset-backed commercial paper market but the problem has proved critical for two particular SIV-lite vehicles. Mainsail II, a $2bn vehicle run by Solent Capital in London, has been forced to begin selling assets, while Golden Key, a $1.9bn vehicle run by Avendis of Geneva, had its commercial paper notes downgraded to the market equivalent of junk status on Friday by Moody's Investor Services, the ratings agency, and is also expected to sell its assets." Barron's(10/15) Just How High Can China's Shares Fly? "If you're Chinese, a "bubble" is something that fizzes in your champagne; after all, your stock market's jumped 400% over the last two years. If you're not, it describes the rapidly swelling valuation of Mainland shares that are largely forbidden to you, but whose valuations are starting to be emulated by stocks in Hong Kong, Singapore and a host of nearby markets. Bubbles always pop, but -- and this appears to be true in China -- it sometimes happens less quickly than some people wish. How bubbly is China? The exchange-traded fund based on the FTSE/Xinhua index of Chinese shares (ticker: FXI) is up 72.7% this year. Matthews China (MCHFX) has jumped 81.3%, and its assets have swollen to $2 billion, even though manager Richard Gao says, "We're getting very cautious." Likewise, U.S. Global Investor China Region Opportunity (USCOX) has risen 73.4%, which has prompted its manager, Romeo Dator, to let some cash build up. And the Greater China Fund (GCH), a closed-end vehicle, has risen 30.8%: Franki Chung, who helps manage the fund, is "worried" bullish expectations won't be met." "There is a creeping concern on Wall Street that the rally to new highs is "unconvincing" - driven more by Fed euphoria than logical reality. This concern became evident last night when JP Morgan downgraded Chinese search engine company Baidu.com. The market had started positively, with several retailers announcing weaker than expected same store sales for September. This is positive because as we know it increases the chance of another rate cut. But perversely Wal-Mart, whose same store sales also disappointed, actually increased its profit guidance. That, too, was positive, so the double positives had the Dow up 120 points at lunch time. Then came the Baidu downgrade. Sometimes it only takes one little stone to tumble to set off a slide. Baidu might be considered a proxy for the whole China-tech story, and here we were thinking such a stock should go to the moon. Baidu fell, and the whole tech sector fell with it. Apple, Google, Research in Motion - all the big names that had performed so well took a hit." "Berkshire has reported selling more than 70% of its stake in the Chinese energy behemoth, and according to The Wall Street Journal, it has likely liquidated its entire position. Some attribute the sales to the Darfur controversy. But I believe that in and of itself, that issue wasn't enough to force Warren's hand. Divestment was put to a vote at the annual meeting and resoundingly defeated. Others attribute the sales to frothiness in the Chinese market. PetroChina shares have returned nearly 1,000% over the past five years and 50% year to date. If you look at the long-term chart, shares have recently gone parabolic. Remarkably, PetroChina is actually the year-to-date laggard compared to Shanghai Petrochemical (NYSE: SNP), Sinopec (NYSE: SHI), and offshore explorer CNOOC (NYSE: CEO)." "Even the stock market — that has been recently blasé about the liquidity and credit crunch in financial markets — smelled today a stinking scheme in this super-conduit and moved sharply down in response to the heightened perceived credit risks and a worsening mortgage carnage ahead that Citigroup and other US banks now face. It took the September 18th Fed Funds cut to cheer the stock markets and bail out the financial system in the attempt to bail out the real economy. It would take much more action by the Fed to make this half-baked scheme fly. With the CDO market being now a zombie, the sub-prime mortgage market being effectively dead, the ABCP market being now comatose and even highly rated asset backed securities in the $400 billion of SIV being altogether frozen it will take more than an half-baked $75 billion rescue plan to resolve the current liquidity and credit crunch that will get worse once the roll-off of the SIVs liabilities surges in the months ahead. How about being honest and starting to accept some of the existing and unavoidable losses on such toxic assets rather than fudging them by trying to put them in another shell scheme? Stock markets have been recently cheered by banks recognizing a whole “$18 billion” of losses when the actual numbers will eventually be —for subprime alone — between $100 billion and $200 billion. This mess was in part caused in the first place by the opacity and lack of transparency in financial markets. So it will take a lot more transparency — rather than half-baked shell games of reshuffling assets and liabilities while charging more fees in the process — to restore investors' confidence." SIV problem is much bigger than I thought. I am trying to get confirmation of this, but it appears that "SIVs have leveraged their capital ($400 billion) to about $2 trillion worth of actual exposure". If this is true, than SIVs likely already have negative worth due to the US's falling housing prices. Theoretically speaking, if citigroup took its SIVs onto its balance sheet and marked them to market, it might completely wide out its stockholder's equity. "To begin to illustrate the magnitude of the crisis, let' s examine the unfolding SIV meltdown. According to professional estimates, 36 SIVs worldwide deploy about $400 billion in capital. According to unofficial “whisper” estimates, these 36 SIVs have leveraged their capital to about $2 trillion worth of actual exposure. [If the number is less than $2 trillion, we' d love to hear about it. But the SIV operators are conspicuously mum on the topic. In fact, the SIV operators ain' t sayin' nuthin' about nuthin' .]" " British banks are especially vulnerable. They face a bill of almost £150 billion, hitting their profitability, if the credit crisis forces them to set aside capital against their exposure to structured investment vehicles (SIVs), leveraged loans and mortgage-backed securities, the Bank says. The banks have promised liquidity lines worth about £109 billion to their SIVs and other off-balance sheet vehicles. If these provisions have to be drawn down and become an on-balance sheet exposure, the full amount in risk capital could have to be put aside. This could come on top of £15.5 billion for leveraged loan risks that have been kept on the banks' books, and £22.8 billion against exposure to mortgage-backed securities. The Bank points out that the £109 billion bill alone was equal to 35 per cent of the banks' on-balance sheet loans to British nonfinancial companies." "NEW YORK -- It's like subprime redux: Some money market fund investors are again wondering if their investments are at risk because another complex investment product has fallen out of favor and become difficult to unload. As occurred this past summer with worries about investments in subprime loans _ those made to borrowers with poor credit _ investors are again uneasy that their cash investments might take a hit. Just as some money market funds invested in subprime loans, some funds have lent money to what are called structured investment vehicles, or SIVs. The SIVs take this money and invest it in high-yielding risky investments like mortgage debt. SIVs make money by collecting more interest on the risky debt than they pay to borrow it." As equity extraction becomes a thing of the past, a recession seems inevitable. I predict there will be continued credit surprises - mostly on the downside - as employment weakens, jobs are lost, and bills go unpaid. As a consumer-led recession unfolds, personal income and corporate revenues won't cover many debts, and the game of always being able to refinance has ended. So, for many borrowers the game is already over; they just don't know it yet. Here is another email about SIV meltdown. I don't know why, but I had assumed that SIVs weren't heavily leveraged. However, the article below suggest otherwise. Although I have no way to verify the information, it does make sense in retrospect that SIVs would be heavily leveraged, considering the credit binge of the last few years. The article suggests SIVs might have been leverages as much as five times: leveraging 400 billion into $2 trillion. If SIVs are leveraged to that extent, then, considering collapse of US house prices, they probably have negative net worth. What do you think? "To begin to illustrate the magnitude of the crisis, let's examine the unfolding SIV meltdown. According to professional estimates, 36 SIVs worldwide deploy about $400 billion in capital. According to unofficial "whisper" estimates, these 36 SIVs have leveraged their capital to about $2 trillion worth of actual exposure. [If the number is less than $2 trillion, we'd love to hear about it. But the SIV operators are conspicuously mum on the topic. In fact, the SIV operators ain't sayin' nuthin' about nuthin'.]" It feels weird sending off emails about my pessimistic outlook for the stock market and economy. So this will be my last email for the time being. I tried to summarize my concerns as concisely as possible. 2) SIV assets are deteriorating at an accelerating rate. 44 percent of SIV holdings are in mortgage-backed securities, and mortgage-backed securities are being downgraded on a weekly basis. As long as housing prices continue to fall, further downgrades are unavoidable. 3) Once an SIV's net NAV (asset value falls) falls below 50%, a clause is typically triggered requiring the fund to liquidate. 4) "Finally, the rate of decline in the average NAV for these SIVs has been very steady from July thru September (like a straight line). The chart on this Web page shows it. The key point I want to emphasize is that if you extrapolate the NAV decline on this chart, the average NAV for these SIVs will pass BELOW 50 BY LATE NOVEMBER. This will trigger the nightmare SIV forced liquidation of ABS that Wall Street is desperately trying to prevent (because it threatens to expose their insolvency.)" 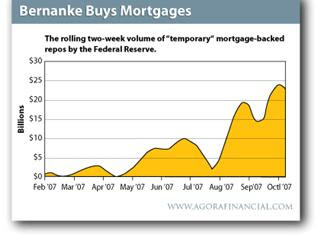 The Federal Reserve has already absorbed about $25 billion in MBS securities via "temporary" repurchase agreements. Repurchase Agreements, known as "repos", are also called Sale & Repurchase Agreements. Under these agreements, the seller (usually a bank) sells securities to a buyer (usually the Federal Reserve) for cash. But the seller (bank) agrees to re-purchase the securities from the buyer (Fed) at a later date. The key point here is that federal reserve won't ride to the rescue because it is already doing everything in its power to stave off forced SIV liquidations. Despite these efforts (and the treasury's idiotic), SIV liquidation seems unavoidable. "Could the Fed conjure up US$1 trillion worth of AB financing between now and President's Day, 2008? Maybe, but probably not without also conjuring up a dollar crisis, or a bond market crisis…or both at once. The only viable path toward recovery and normalcy requires a legitimate mark-to-market. But marking MBS and CDOs to real-world prices might clip tens of billions of dollars from bank balance sheets…and might kick a few dozen millionaire-bankers to the curb." Take Citigroup as an example. Citigroup's structured investment vehicles (SIVs) have approximately $65.5 billion in net tangible assets as of June 30 2007. This $65.5 billion has likely been leveraged to $400 Billion or more of exposure. In summary, Citigroup has $65.5 billion in net tangible assets and over $400 billion in leveraged exposure in off balance sheet SIVs and conduits. If Citigroup were forced to mark its SIV assets to their market value, it would wipe out its net tangible assets and push it into negative territory. Before the year end, several SIV's NAV (asset value falls) will fall below 50% triggered immediate liquidations (it has already happened to two SIVs). This will trigger massive selling of mortgage CDOs for which investors have little appetite because of the lack of transparency and ailing housing market. These sellings will force other SIVs to mark down their assets which will trigger further liquidations. Even if an SIV's NAV doesn't fall below 50%, they may be forced to sell assets because they can't find financing (the feds can't go on "repoing" CDOs forever). Because SIVs are so leveraged, their liquidation losses will be magnified several times. I don't have years of experience in finance, but the outcome seems clear to me. When banks leverage their assets 10-15 times in off balance sheet SIVs to hold risky mortgage CDOs in a crashing housing market, you get a financial crisis of historic proportions. Small banks will likely be wiped out. Large banks like Citibank might survive, but, if they do, they will be worth much, much less than today. Consumer lending and spending will be severely affected. The demise of structured finance will influence the world for decades to come. Consumer sentiment is reaching all time lows not only in the United States, but most of Europe. As housing prices continue to drop and credit becomes more difficult to obtain, consumer spending decline rapidly. As evidence of this spending slowdown (and the SIV meltdown) begin to emerge, it is likely that China's stock market will crash. The fate of China and its stock market are linked to the fate of American and European consumers. As the biggest exporter to the US, news of slowing demand in the US will burst the Chinese stock market bubble. The Chinese market as a whole is trading at 50 times declared earnings, and those earnings are inflated by paper profits. According to Morgan Stanley, 31% of Chinese corporate profits are from equity investment (companies investing in soaring stock market). When the Chinese market market it will bring down a good part of Wall Street with it. Hundreds of companies will have to mark down the value of their Chinese holdings (Yahoo Inc would drop like a rock). "According to various estimates I've seen, there are about three dozen SIVs operating globally. These SIVs carry a capital base of some US$400 billion. But that's NOT the total exposure to potential losses. That's because these SIVs are leveraged to the hilt the way many South American "banana-republics" used to be (or the way U.S. consumers are today). The total leveraged assets are perhaps US$2 trillion or more. If a huge mass of traders dump their SIVs at wholesale prices, Mr. Paulson's bailout fund (er, that is "Superfund") worth US$80 billion will be just a drop in the bucket compared to a torrent of unwinding sub-prime investments." "In addition, many of the SIVs are leveraged 10-15 times or more. You might liken the process to a pyramid where you take short-term paper and use it for leverage to purchase long-term paper that pays a better yield. This if you get a spread of 4% and leverage it up 10-15 times you get a high risky return." "We told you that SIVs hold $400 billion in 36 of these vehicles. We are told these positions have been leveraged giving banks about $2 trillion in real exposure. This is an insolvable problem. Many banks have to be in serious trouble. Then there are the money market funds, investment banks and brokerage houses, hedge and pension funds. It doesn' t look good." "To begin to illustrate the magnitude of the crisis, let's examine the unfolding SIV meltdown. According to professional estimates, 36 SIVs worldwide deploy about $400 billion in capital. According to unofficial "whisper" estimates, these 36 SIVs have leveraged their capital to about $2 trillion worth of actual exposure. "Citigroup notes that the leverage in this particular vehicle, Beta Finance, is "only 14.24 times." Thus, Citigroup, a leveraged entity, owns a gaggle of leveraged S&Ls. ; That helps illustrate a point I've made many times: that the well of liquidity that bulls were citing two months ago as a reason to be bullish was just a wall of leverage. (It's worth noting that the net asset value of Beta Finance has declined 19% from its high and that Citigroup's other conduits are apparently down a similar amount.)" "Since almost all the investors who comprise the free market refuse to purchase asset-backed commercial paper, the Federal Reserve has stepped into the breach. In other words, the Fed is now financing the very same stuff that the world's private investors refuse to finance. What more do you need to know about the gravity of America's credit crisis? Already, the Federal Reserve appears to have absorbed about $25 billion in MBS securities via "temporary" repurchase agreements. Repurchase Agreements, known as "repos", are also called Sale & Repurchase Agreements. Under these agreements, the seller (usually a bank) sells securities to a buyer (usually the Federal Reserve) for cash. But the seller (bank) agrees to re-purchase the securities from the buyer (Fed) at a later date. Typically the banks use Treasury bonds or government-agency bonds as repo collateral. Lately, however, mortgage-backed securities (MBS) have become the collateral of choice. In the early part of this year, the Fed rarely "repo'ed" an MBS. Weeks would pass between MBS repos. But as springtime arrived, MBS repos started popping up like so many daffodils. Just a few at first, then a few more, then eventually enough to absorb a money center bank's entire short-term liabilities...for example. The rolling 2-week total of "temporary" MBS repos soared from about zero in June to a whole bunch in August...and the repos are on the rise again, despite the "recovering" credit markets. "How Big is the Problem at Citigroup? With a hat tip to Polecolaw for the idea, let's compare net tangible assets at Citigroup to the amount at risk at SIVs and conduits. Let's use $160 billion figure for the combined SIV and conduit numbers and see what comparisons we can find. Citigroup Net tangible assets as of June 30 2007 are $65.5 billion. That's kind of interesting isn't it? Citigroup has $65.5 billion in net tangible assets but $160 billion invested in off balance sheet SIVs and conduits. If a fire sale of those SIVs and conduits resulted in a 25% loss, Citigroup would have net tangible assets of $25.5 billion. If a fire sale of SIVs and conduits resulted in a 41% loss in those SIVs and conduits, Citigroup would have zero net tangible assets. Does Paulson, the Fed, or Citigroup want to find out what those assets are worth? Of course not. That is the reason for a Don't Ask - Don't Sell policy and approval of Enron Style Accounting by Paulson." "The average net asset value of SIVs rated by Fitch fell to 73 on Sept. 28 from more than 100 in July. A 0.5 percent drop in value of assets is equivalent to a 7 percent decline in the so- called NAV, Fitch said. Once an SIV' s net asset value falls below 50, a clause is typically triggered requiring the fund to liquidate. The rate of decline in the average NAV for these SIVs has been very steady from July thru September (like a straight line). The chart on this Web page shows it. The key point I want to emphasize is that if you extrapolate the NAV decline on this chart, the average NAV for these SIVs will pass BELOW 50 BY LATE NOVEMBER. This will trigger the nightmare SIV forced liquidation of ABS that Wall Street is desperately trying to prevent (because it threatens to expose their insolvency.)" "When - and how bad? Still, this is a bubble and all bubbles burst. There are really only two questions. When will this happen and will the rest of the world get caught up in it? There's no rational answer to the first part of that question. China's stock market could crash tomorrow, but it may go on for a year and double again before anything happens. That doesn't mean there is still time to clamber aboard. After all, if no-one knows where the buffers are, then getting off before it hits them isn't going to be possible. To the second question there is a clearer answer. The rest of the world can no longer insulate itself from what happens to China. Just a few tremors in the Shanghai market in February were enough to generate a ripple of fear around the world's share markets, causing prices to fall sharply. When the real China crash happens it will be worse. Local investment companies' profits will evaporate. Many domestic financial institutions who have lent to them will be in trouble. These are the ones financing China's expansion. While that may not bring the economy to a shuddering halt, it will certainly slow it. Whether the global economy is hit hard by this, or merely spooked, share prices around the world will be hit. One reason is the vast number of western companies with interests in China and whose growth rating is predicated on it. For those western investors who have invested in China through funds or directly, it will not be pretty. So if you've got money in China and have done well, you might be advised to do as Warren Buffett has done and take some of those profits." This entry was posted in Important_Announcement, Old_Emails. Bookmark the permalink. You were right on target about the banks!